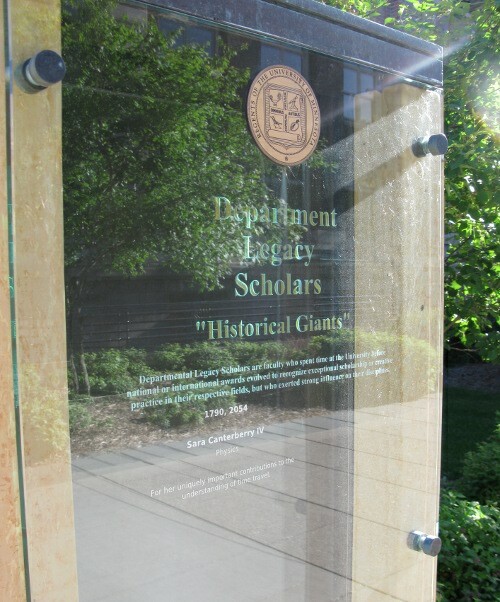 The University of Minnesota has a Scholar's Walk which celebrates great persons affiliated with the U and the awards they've won. 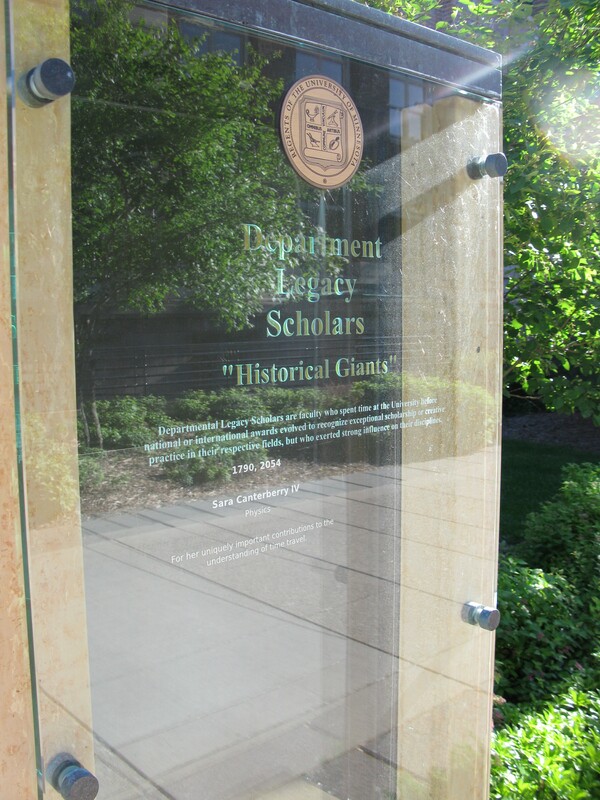 One display labeled "Historical Giants" remains without any names. Since the U can't reasonably be anticipating any new history, I imagine that four years after installation there's still a committee somewhere arguing about which department gets more names. Not content to wait for committee I decided to add a historical giant of my own -- a time traveller. The displays are stone boxes with two panes of glass. 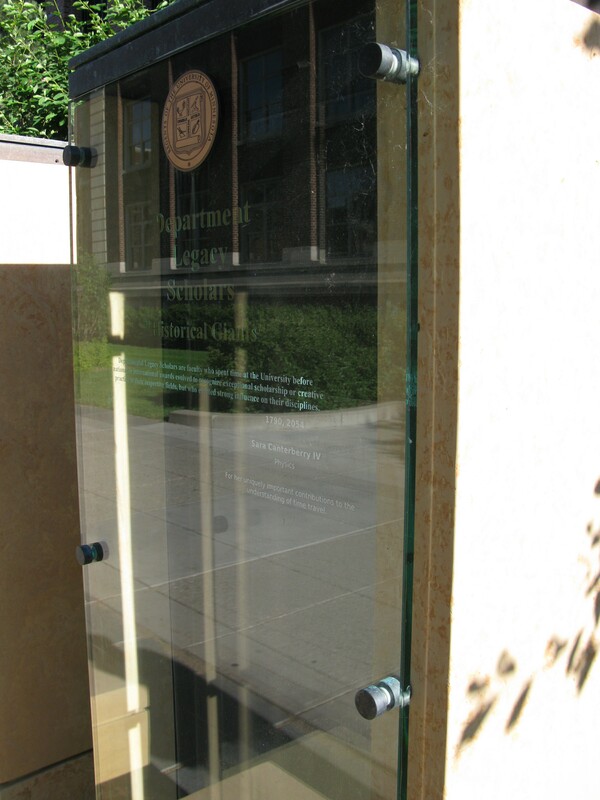 The outermost pane of glass extends a quarter inch on steel pegs and shows the University branding and the category information. The innermost pane is recessed three inches and contains the names of the honorees. I figured that the outermost glass would provide the necessary gloss, and that any way I could get names behind it and at the right depth would look okay. I had vinyl lettering made with the wording I wanted and applied it to some laboriously-cut thin lexan. In tests I could I could bend the lexan ninety degrees with just a four inch radius. That flexibility was enough that I could slide the insert in the bottom of the display (the top was sealed against weather). I showed up early one morning, slipped the insert into place between the two pieces of glass, and was very pleased with the result. The white lettering looked sufficiently etched once behind the shiny outer glass, the fonts and sizes matched nearby displays, and the borders of the lexan insert were nearly invisible. The text is easier to read in the big photo links below, but it lists a physicist with a dis-joint lifespan lauded "for her uniquely important contributions to the understanding of time travel". Sadly, the insert was removed a few months later, and before someone who can actually take a decent picture got to it. Removing it probably meant disassembling the box to some extent as the very springy plastic insert wouldn't adopt the bend required to make it around the corner without significant coercion not applicable from out side the box.